We have a buffet with 70 different kinds of food. 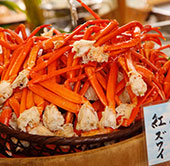 Enjoy as much crab, sushi,... as you want. We have freshly renovated rooms and suites with beautiful vies of Mt. Fuji. 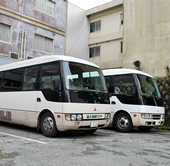 We provide free shuttle bus service from Odawara Sta. If you book your stay on this website. *not available in peak season. Number of Adult Guests 2 3 4 person(s). Child A 0 1 2 person(s). Child B 0 1 2 person(s). Child C 0 1 2 person(s). We have a variety of rooms for...choose what suits you best, and enjoy your stay! Stay in one of our newly renovated rooms! 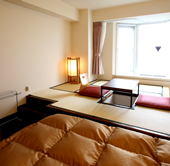 We have partly Japanese -style twin room for up to 4 people、twin rooms for up to 2 people、and another type of twin rooms,Non-smoking Twin, Smoking Twin, all renovated in 2016. which one would you prefer? 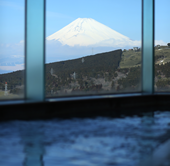 Our hot springs baths have a panoramic view, both of Mt. Fuji and overlooking Suruga bay. Visit our restaurant for a generous 90 minutes all you can eat, including our famous gourmet seafood and desserts. We have a pick-up service from Lake ASHINOKO and Odawara Sta. It's only for guests who make a hotel reservation on official website.